Greek historian and geographer, Strabo (63 BC – 24 AD), wrote that the stretch of Italian coast from Cape Miseno to Sorrento—the Gulf of Naples—seemed a single city, so strewn was it with luxurious villas and suburbs of the main city of Naples. The eastern end of the bay, before the land swings out to form the Sorrentine peninsula, is of course known today as the site of two towns that met their doom in the great eruption of Vesuvius in 79 a.d., Pompeii and Heculaneum. There is a third, lesser–known, and little–excavated town: Oplontis. It lies beneath the modern–day town of Torre Annunziata, such a short distance from Pompeii that it was almost certainly a suburb of that larger town and probably the port for Pompeii, so close is it to the sea. The only large, significant excavation at Oplontis is the "Villa of Poppaea," referring to Poppaea Sabina, Nero's second wife. That is at least a possible conclusion from an amphora fragment bearing the name "Secundus," one of Poppaea's servants. In any event, it was almost certainly an imperial residence, opulently equipped as it was with a 60 x 15-meter swimming pool, a large number of rooms, intervening gardens and courtyards, and murals on the walls that are still splendid. 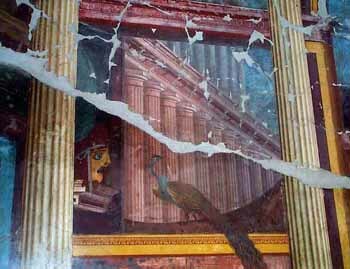 Some of the extant murals are beautiful examples of the so-called "second Pompeian style," depicting artificial architecture on the walls; that is, painted windows opened onto painted sea or landscape or onto painted rows of columns that fade away from the viewer through the use of perspective, all to give the illusion of space. It was, no doubt, one of the villas that impressed Strabo so much. and the trompe-l'oeil effect of the bird's tail. The existence of such a regal residence is, in fact, noted in the Tabula Peuteringiana, a medieval copy of a Roman road map. The villa and whatever other structures made up the small town of Oplontis were buried in the great eruption, however, and it wasn't until the 1500s that the Spanish rulers of the Kingdom of Naples came across the ruins of the villa while building an aqueduct. And it was not until the mid-1700s that further excavation was undertaken in the same wave of archaeological interest that spurred Charles III and then his son, Ferdinand IV, to lay bare such antiquities as Pompeii and Herculaneum. Yet, Oplontis remained, and remains, relatively unknown; the swimming pool wasn't uncovered until the 1970s and the site, itself, was not open to public visits until the early 1980s. The excavation is not complete and never will be, since Oplontis, like Herculaneum, sits beneath a modern town. To get into the site, you walk down a ramp until you are at ground level, 79 a.d. (about 30 feet below the modern streets and buildings that surround Oplontis). By far the most striking thing about Oplontis is what you don't find —human remains. And there are no lava molds of people huddled together in death, as there are at Pompeii. The Villa Poppaea was deserted when Vesuvius erupted. In the wake of an earthquake that damaged the town and villa severely in the decade before the great eruption, people had moved away so reconstruction could take place. Presumably, the residents were elsewhere, making typical complaints about how it took the Egyptians less time to build the pyramids than it does for us Romans to put a few bricks back in place, when real disaster struck. It took some doing, but at last tourists and locals alike finally have a chance to see some of the treasures of Oplontis, the least-known of the Big Three sites destroyed by the eruption of Vesuvius in 79 A.D. (the other two are Pompeii and Herculaneum.) The exhibit is at Palazzo Criscuolo in the town of Torre Annunziata, location of the ruins. On display on the premises of Palazzo Crisculo are 70 items from the ruins. The exhibit is entitled A picco sul mare. Arredi di lusso al tempo di Poppea [roughly, "Looking down at the sea. Luxury in the age of Poppaea."] The exhibit will run into December of this year. The project is part of the ongoing effort to open Oplontis —that is, the physical site, itself— to more and more persons. That plan continues and involves the participation of local high school students in the creation of a virtual reality reconstruction of the entire site that can be delivered to smart phones.